MRI scan, medically known as Magnetic resonance imaging (MRI) of the body is a very powerful tool used in the diagnostic department today to detect and diagnose many diseases easily which cannot be diagnosed with other tests. MRI scan uses a magnetic field, radio waves and a computer to capture and create images of the organs and tissues of our body. It can also be used to monitor treatments for a variety of conditions associated with the chest, abdomen and pelvis. Mumbai is one of the developed and fastest cities of India. The population of the “city of dreams” is estimated to be 21.3 million (2016). Also called the financial capital of India, it is filled with immigrants from all over the country and is home for the highly rich as well as the poor. Mumbai is also known for the long spread slum areas and about 49 percent of population of Mumbai lives in slums (according to 2001 census). The city faces an unresolved problem of communicable and non-communicable diseases. Mumbai is facing a practical pool of lifestyle diseases like diabetes, cancer and obesity. 15.11% of the population is suffering from diabetes followed by obesity 14.29 %, a recent report released by Indus Health Plus showed. The biggest underlying risk factor for chronic disease in older people is high blood pressure, and the middle age working groups of people have developed wrong eating habits and a shift to junk food, high use of tobacco and consumption of alcohol, stress and changing lifestyle. Chronic non-communicable and communicable diseases like hypertension, diabetes, intentional and unintentional injuries, tuberculosis, rheumatic heart disease, and HIV infection are the most common diseases in the slums and the urban areas face NCDs such as cardiovascular diseases, asthma, and kidney and liver diseases. The threat of cancer lurks over every 1 individual out of 5 in Mumbai. Among working women, almost 75%, were found to be having one of the other risk factors for breast cancer. How can MRI help prevent Ill-health? MRI is an advanced tool used in the radiology department today to detect and diagnose several diseases and abnormalities associated with almost all the organs of the body. MRI has proved its existence in the field of Cardiology, Neurology and Oncology. Let us take a look at how MRI scan helps in detecting and diagnosis diseases associated with different parts of the body. MRI of the Brain – the MRI of a brain and spinal cord helps in detecting any blood vessel damage, brain injuries, multiple sclerosis, spinal cord injuries, stroke or existence of any tumor. MRI of the Heart – this scan helps detect blocked blood vessels, damage caused by heart attack, problems associated with the heart structure (example – enlargement) and if there are any other heart diseases. MRI of bones and joints – helps assessing bone infections, damage to the joints, disc problems in the spine, joint tumors and cancers. MRI of the Abdomen and Pelvis – helps diagnose problems associated with stomach, kidneys, liver, and pancreas. It also helps in assessing problems in the cervix area. The pelvis is checked for diseases of the ovaries in women and prostate in men. MRI is also proved beneficial in diagnosing cancer of the breast, brain and many other types of cancers. A special kind of MRI called the functional MRI is used to map the brain activity. This is very helpful in diagnosing diseases like Alzheimer’s. What is the procedure for MRI? Before the procedure it is advised to inform your physician about any health problems, recent surgeries or allergies and if you are pregnant or breast feeding. During the procedure the patient needs to lay down on the table that slides into the tunnel shaped scanner. The scanner then sends radio signals to the body to which the body using the magnetic field responds and sends back the signals to the receiving device attached to the machine. These signals are then captured as images and further processed using a computer to analyze the results. This entire process is a mechanism. Our bodies are made up of elements called protons. These protons respond to the radio signals that the machine sends to the body and these elements in the various body parts emit back signals differently which helps the doctors to distinguish between the soft tissues and hard tissues. MRI has been very helpful in diagnosing several diseases, abnormalities and malfunctioning of the organs of the body. The procedure requires the patient to remain still because any movements during the scan may disturb the image clarity. Hence, few patients may be given general anesthesia to keep them still during the scan. These scan machines are pretty noisy and they almost sound like a mill or an aircraft engine and to reduce this discomfort the patients may be provided with headphones to listen to some music during the scan. Even though the computer simultaneously captures the images, it may take while for the radiologist to analyze the results. Post scan the patient may be asked to rest for a while and then let go. Future of MRI – very beneficial! Mumbai has the best Public – Healthcare infrastructure but yet falls short in meeting the healthcare needs of everyone in the city. There is still an untouched group of population suffering from chronic diseases. Detection and treatment of these diseases at an early stage and at affordable costs is the priority of the city and BMC has been showing up efforts to do that. There are several measures BMC is taking to create awareness about wellness and good health. The main focus of people is turning out to be wellness and prevention of lifestyle diseases, and they are trying to create a culture of healthy living among younger generation. MRI is also considered to be a part of the preventive health check-ups. To make MRI affordable and accessible to all, Mumbai has started providing MRI scans at nominal rates and 50% discount at the conceptual health centers started at the local railway stations called the “one rupee clinic”. Likewise the advanced technological developments in the making of MRI machines have made wonders to the diagnostic industry. After Delhi got its first open standing MRI scanner in 2011, Mumbai could not wait to get it. Today Mumbai also caters with these open MRI scanners and this has given amazing benefits to the diagnostic industry. This new open standing MRI Machine is a revolutionary platform used for musculoskeletal applications including the spine and it provides surgeons a unique additional diagnostic element. Unlike the traditional MRI scanner, the open MRI system has no tube and the patient is free from the discomfort and anxiety. It helps to create a more relaxing scan experience and patients are able to complete the scan without any hurdles. This machine also known as G-scan has proved to be a boon to claustrophobic patients and is helpful in capturing accurate images in the weight bearing positions. Another development we have been able to see is the fetal MRI performed first at one of the well known hospitals in Mumbai. The ultrasound or sonographic findings sometimes become inconclusive or insufficient for proper evaluation of fetus, during such situations; a fetal MRI scan can help in the evaluation of intracranial abnormalities. This Fetal MRI is increasingly used in clinical practice today mainly because of the advances in case of fetal surgery and fetal medicine. It has been very helpful to find or assess the fetal brain, fetal spine, and fetal body. With the traditional MRI scanner, we were able to diagnose cancer, the stage and the location. But today, with the advanced technologies used and the combination of MRI with PET, we are able to not only diagnose cancer and locate it but this machine is helpful in charting out the possible course of malignancy in the future and how and where the cancer would grow and extend in the future. This new cancer screening test can detect the disease in the body with greater accuracy. With such developments happening around, MRI scans have proved to be life saving and will definitely be helpful in early detection and prevention of many chronic diseases. To host a MRI scanner in a center it is very important to have approvals from AERB and certifications from ISO and NABL. A MRI machine is very expensive and the entire setup may cost anything more than 30 crores, including the doctors, trained technicians and a full time radiologist. All this ends up making MRI scan an expensive one. The standard cost of a MRI scan in Mumbai is between INR 4,000 to INR 15,000. MRI of single body part may cost anything between INR 2,000 to INR 6,000 and MRI scan of abdomen, pelvis and whole body may cost anything above INR 8,000. If the scan demands a contrast dye, the scan may cost INR 2,000 to 3,000 more than the standard market rate of the scan. Higher the technology used, greater will be the cost of the scan. The cost for MRI scans may vary across the MRI scan centers of Mumbai and also depending upon the type of scan undertaken. 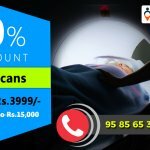 How can you avail 50% discount on the MRI Scan cost? You may have several options of MRI scan centres and different packages that offer different cost. But to find the one that suits you the best is a task. Bookmyscans is an online guide and a one-stop destination to all your diagnostic needs, and we provide you information about the MRI scan centres nearest to you along with the prices. We let you compare the MRI scan prices online and then decide on the online booking of these tests at your MRI scan centre. We are aligned with many approved and certified MRI scan centres in Mumbai. We periodically audit our list of partners to ensure that the foremost standards of service and technology are maintained and you get the best quality scan reports. 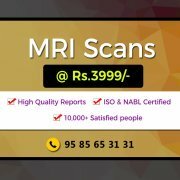 We make sure the scanners used at the partnered MRI scan centers are high-end, state-of-the-art equipment from renowned manufacturers and it is capable of performing the advanced techniques. In today’s fast paced life we understand the importance of time and we provide online appointment booking service throughout the day. 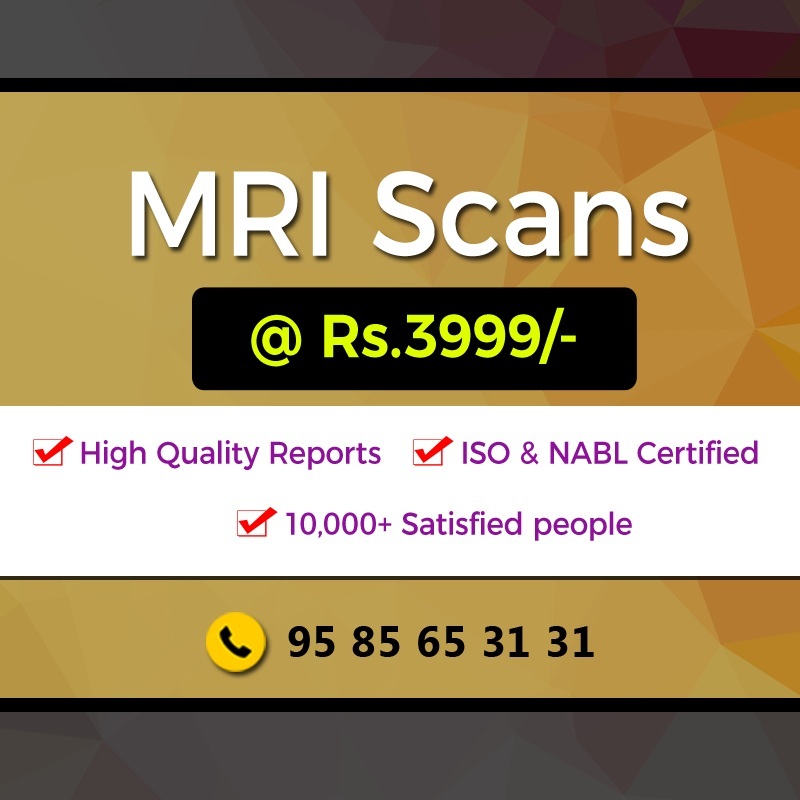 At Bookmyscans we assure you 50% discount on the standard rates of the MRI scans. We have been able to help more than 10,000+ people meet their diagnostic needs at affordable prices, saving more than 1.2 crores on the diagnostic and curative treatment costs. Easy availability of the reports is an added advantage and they can be downloaded when necessary.